In honor of Back to the Future Day, let’s go back to Marty McFly’s era (1985). 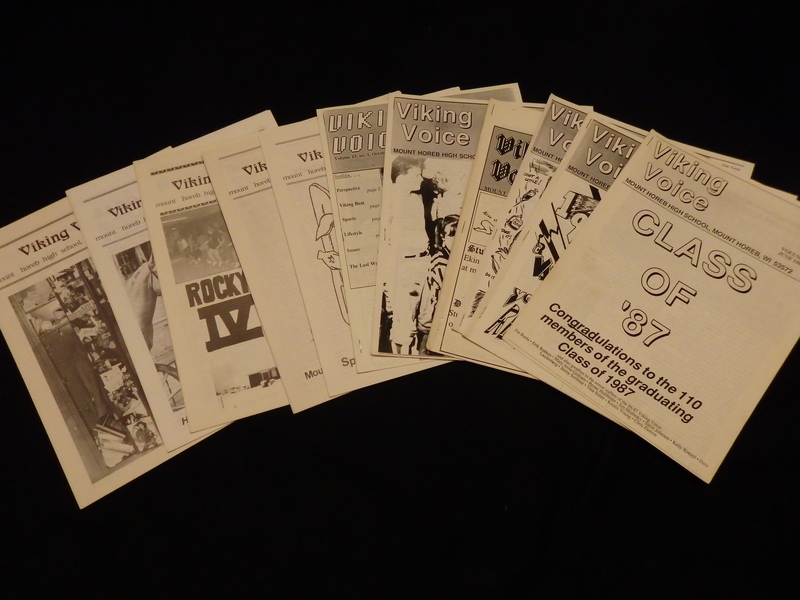 I joined the Viking Voice high school newspaper staff that year and we published an article a month for the next year and a half. Things slowed in the second semester of Senior year. I learned a lot there and had a great instructor – and there were several great ones at Mount Horeb High School at the time. “Being on the Viking Voice must be easy. Writing stories and then seeing them in print can’t be very hard.” As any staff member from the past or present will maintain, writing for the Voice isn’t as easy as it sounds. There is the writing and revising of stories, layout, deadlines and assembly of the final product. But behind the black and white of those printed pages that appear in our high school once a month, is a story to be told. The story, interestingly enough, is the evolution of the Voice into what it is today. The Voice is actually more of a newsmagazine than a newspaper. It is almost impossible to print recent, up-to-date news because the Voice is only printed once a month. Instead, mainly feature articles appear in each issue. But where do ideas come from? Won’t the staff run out of ideas and then begin repeating previous stories? Mr. Van Natta, staff adviser, stated that subjects for stories will never run dry because of constant changes in people’s tastes. In this respect, stories can be repeated every few years as ideas and views change. Before the Viking Voice changed its name from Cardinal Highlights via a contest in 1971, there wasn’t a class in newspaper writing. The class has helped to produce better papers and also helped some students in realizing careers in journalism. For example, Chris Lloyd, who wrote and was a photographer and graphic artist for the Voice, is now employed at WHA-TV after graduation from UW-Madison. Mike Dangerfield is presently attending UW-Madison and has worked as an intern at WISC-TV. Tim Brightbill is attending Northwestern University in Chicago. He enrolled in the school of journalism and writes for the university newspaper. Jane Burns has gone on to become editor or the sports page of the Des Moines Register after her graduation from Drake University. She also writes a “Picks and Pans” column for the sports page. So if sometime in the future you pick up a newspaper or magazine article written by someone who sounds familiar, the author may be a former Viking Voice staff member.